I’ve mostly been defending the fact that the majority of the direwolves are dead and that the showrunners are probably doing a reasonable job with them in the adaptation, although that’s not a popular fan-held position. Just a reminder, I’ll be talking about the show and the books. So spoilers abound if you’re behind on your viewing or watching. Two posts ago, I talked about the Stark direwolves Lady and Greywind, and the most recent post in this series featured Shaggydog and Summer. Up next are the last two wolves in the story, Nymeria and Ghost. So if the direwolves are alive in both media, why am I even including them in a series called Defending Dead Direwolves? Alive or dead, how the show adapted Arya Stark’s and Jon Snow’s wolves is interesting since it gives insight into what might be happening in the books, even if the show is ultimately revealed to not be following the unpublished works as canonically as it did for the early novels. As I’ve mentioned in previous posts, the showrunners appear skittish on committing to showing larger-than-life direwolves, particularly when interacting with the flesh and blood actors. It can’t just be the expense, since they pour dollars into the dragons. But dragons might have priority budget-wise. Because of the reluctance to fund more direwolf sightings, the times when the wolves are omitted and when they’re included are noteworthy. That sound you hear is my heart breaking, friends. Nymeria is driven off by Arya early in the first book, to keep her safe from Lannister reprisals after the unpleasant encounter with the ever-unpleasant Joffrey. This was faithfully reproduced in the first season of the show using a real dog actor, and Nymeria had not been on camera again until the most recent season when Arya, fresh from her interrupted unpaid internship with the Faceless Men of Braavos, runs into Nymeria in the Riverlands. This might indicate that Arya will be reunited with her lost pet in the books, but I am not putting money on that. In typical fashion, the showrunners downplayed the reunion with minimal screen time between the CGI canine and the human sized actor. The meeting played off as less of a reunion, and more as addressing loose ends. That moment wasn’t unique in the seventh season between our heroes and long-lost companions. Financials aside, and even if Benioff and Weiss were comfortable with the uncanny value of the huge wolf in close proximity to humans, I’m not surprised that the show didn’t have Nymeria linger with Arya. Arya was journeying back to Winterfell but also into the larger narratives of Game of Thrones. Namely, the war against the White Walkers and the unresolved question of who will end up on the Iron Throne. Nymeria will probably not enter into those arenas. But Nymeria still could have a role to play in the books. After being driven off by Arya following Joffrey’s mauling, Nymeria was not absent from A Song of Ice and Fire. As the story progressed, rumors grew of an enormous wolf leading a pack of more conventially-sized wolves, haunting the Riverlands. Nymeria’s pack was one of the many elements contributing to the general chaos and dangerous conditions in the Riverlands. The War of the Five Kings hit the region especially hard, staring with the depredations of Ser Gregor’s marauders bringing the raiding torch to the kingdom. Lord Tywin’s armies followed, dispersing the royal expeditionary forces lead by Lord Beric Dondarrion who had been sent in to take on bandits and who had ran into a full Lannister invasion instead. Robb Stark’s northmen entered the territory with swords drawn; they were arguably better than the Lannisters, but not entirely innocent of rough treatment to the locals. The remnants of Dondarrion’s men formed the idealistic Brotherhood without Banners, but later transformed into a less-idealistic group under the leadership of a certain stone-hearted lady. Despite the Lannisters and the Freys trying to re-exert control after the Red Wedding, bandits and outlaws ruthlessly abused the unprotected country folk. A pack of wolves might not even be the most dangerous thing in the Riverlands. The show did present some of this chaos in the region, with Lannister troops abusing their position in taverns, ruffians like Rorge and Biter roaming about (And ill-advisedly hunting the Hound for bounty), and peaceful sept-building smallfolk slaughtered by outlaws. The full complexity from the books isn’t there (no Broken Man speech, no Bloody Mummers on the loose, or an ersatz-Hound attacking Saltpans) but at least problems in the Riverlands are touched on. And to the show’s credit, Nymeria is shown with her pack. We can extrapolate Nymeria’s wolves hunting with terrifying success in the hills and woods. I assume that after Nymeria and Arya have their encounter, the Lannister soldiers who shared their meal with Arya become meals themselves. That element isn’t really missing. What’s missing is Arya dreaming wolf-dreams while in Braavos, about Nymeria and her smaller allies. I should not be dreaming wolf dreams, the girl told herself. I am a cat now, not a wolf. I am Cat of the Canals. The wolf dreams belonged to Arya of House Stark. Try as she might, though, she could not rid herself of Arya. Nymeria looms somewhat large in both Arya’s unconsciousness and in her Braavos storyline. Part of the requirement of being a Faceless Man is to achieve a state of non-identity, to become No One. Arya, to her credit, works hard to disassociate herself from her former identity as Arya Stark. Well, mostly. One notable exception is her reluctance to part with her precious sword Needle. And she can’t necessarily control her dreams. By day, Arya diligently follows the directives of the House of Black and White. But by night, she’s a wolf. And a wolf is not No One. 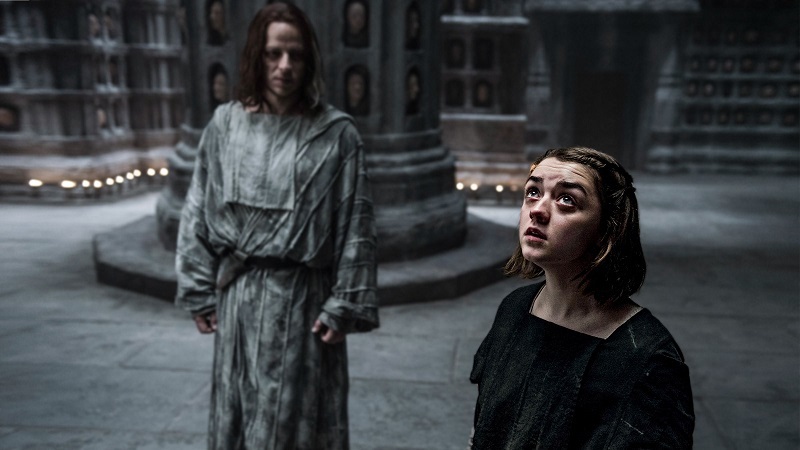 The show opted to omit Arya’s wolf-dreams and instead went with a more contentious relationship between her and the Faceless Man known as the Waif. The Waif provided an antagonistic focus for Arya that would eventually lead to Arya’s cessation of training with the assassins. This is just speculation, but Arya’s wolf-dreams from the books feel like they should contribute to Arya washing out of magical murder school. If the final exam requires one to be No One, Nymeria’s role as an unshakable memento of Arya Stark’s identity might be an obstacle that not even Arya’s determination and grit can overcome. Syrio Forel is the Waif! Arya is dead, and the Waif wears her face! The audience was simply expecting something deeper than the Waif taking a dislike to Arya, and then completely botching her several opportunities to kill Arya. My feeling is that the rather uneventful and cerebral narrative of Arya compliantly following the guidelines of The Kindly Man while having feral dreams – as much as it might be faithful to the books, wouldn’t come across as particularly cinematic. And, the show does have a good track record in making non-canonical decisions when adapting Arya’s story. They might have felt they could continue that trend. Neither behaviors of keeping quiet and keeping one’s head down necessarily makes for good television. So the show took some liberties to give Arya’s story pep and context. Melisandre of Asshai gave the viewers an ominous prophecy regarding Arya, and earned a place on Arya’s murder list despite them having no interactions in the books. When Melisandre said “we’ll meet again” you know that I made a note of that. Arya meets Brienne of Tarth while under the Hound’s control in an electric confrontation that was non-canonical but tremendously satisfying. Most of the times, these manufactured-from-whole-cloth scenarios worked well cinematically and expositionally. The Braavos storyline from the books probably provided less options to work with, and couldn’t really be expanded on to be digestible for the viewing audience. Arya: Hey, I had this really weird dream last night. Waif: I don’t care. I also harbor no ill-will towards you. Arya: I don’t know why you feel you have to say that, but that’s cool. I’d hate to have to kill you or something. Arya: Hey, would you mind if I said out loud a bunch of observations I’ve had in my head about you guys here in the House of Black and White? Waif: I would hate that. Would you mind being quiet and just thinking stuff? And might not have really provided all that more impactful a payoff. Jaqen H’Ghar: Hey, you still seem like someone to us. 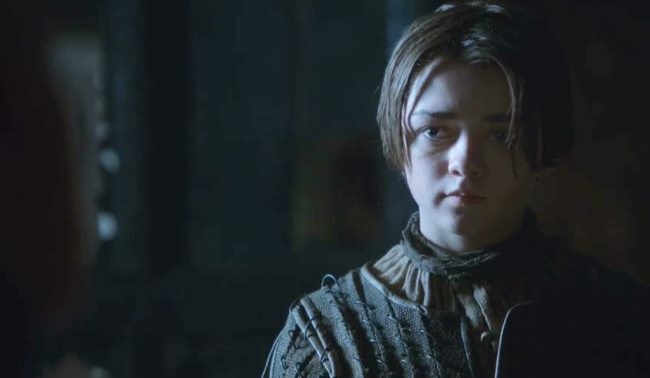 Arya: I’ve been trying real hard to be nobody, but my dumb dog keeps bugging me at night. Jaqen H’Ghar: We’ve heard the “my dog keeps eating my homework” excuse before. You’re expelled. Safe travels home. Either way, Arya leaves the House of Black and White for home, where the cinematic action is. Much of the above speculation about Nymeria and her role in interfering with Arya casting aside her identity fully for the Faceless Men is just that, speculation. But it fits the overall theme we’ve seen with the direwolves. They have a strong connection with the identity of their respective child, and their names are important. Arya named her wolf after the Queen of the Rhoynar, Nymeria. That legendary queen famously brought her people to Westeros from Essos. 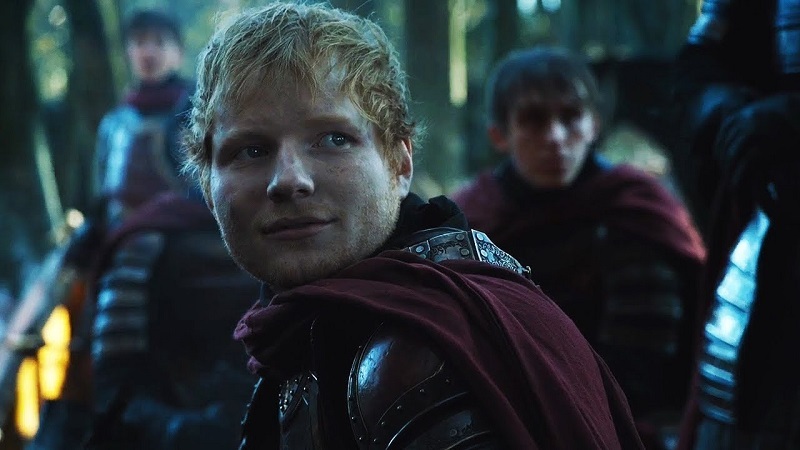 If the speculation above is correct, Nymeria’s warged-connection with the Stark girl will be responsible for bringing Arya back to Westeros from Essos. And that seems like a fitting instantiation of a direwolf’s purpose. Also, I like comparing Bran and Arya at times. They both get invites to an exclusive magical school. They both learn some cool magical tricks. But Bran loses his direwolf and his identity, becoming someone else: the Three Eyed Raven. 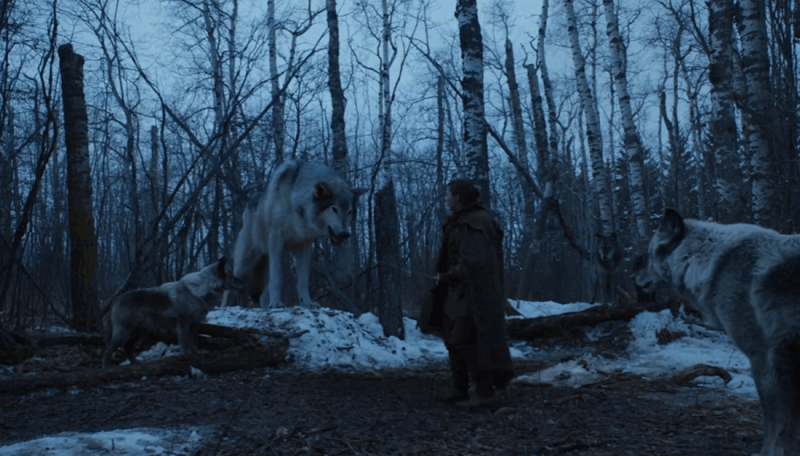 Arya “loses” her direwolf early on, but her wolf safeguards Arya’s identity, hypothetically preventing her from being someone else. I really need for The Winds of Winter to come out. 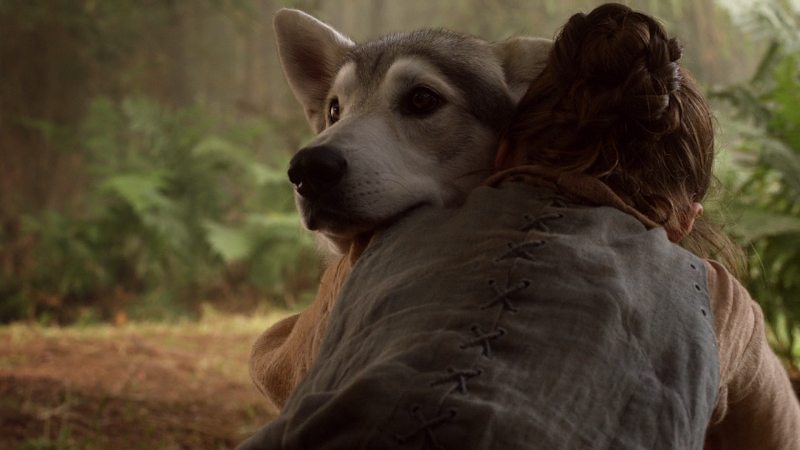 Now that we’ve seen Nymeria on the show, will we see her again? I feel confident that Nymeria’s pack will have some impact in the books, at the very least in the continuing tales of dread told by nervous Lannister troops. But I doubt the show will provide much focus on the persistent strife in the Riverlands since the Army of the Dead is now marching south of the Wall. There are only six episodes left and there are probably narrative priorities to hit. Based on Summer’s death at the hands of a horde of wights, I don’t know if I want Nymeria and her support wolves to be part of any engagement against the Night King and his vast, monstrously large army of monsters. A pack of wolves might be terrifying to flesh and blood opponents, but the walking dead aren’t afraid of wild animals. With Nymeria’s book exploits minimized on the show, and any speculated role being hand-waved away as uncinematic, we should probably be pleased that we got to see Nymeria at all. And that she’ll probably survive by keeping a low profile. Let’s call that a win. Alright, I should probably pack this post up. Look, I was going to follow the previous posts’ pattern and have two direwolves for each article. But as is evident above, I had a lot to say about Nymeria. So many words. I’ll kick out a companion post just featuring Ghost soon, which is going to mess up my five-post numbering scheme, sort of. But, I’m not displeased with promising Ghost and then not having him show up, because that’s largely been the role of Ghost on the show. Because we occasionally hear about Ghost, but we don’t always get to see him. “Where’s Ghost” indeed. Usually nowhere near Jon. Jon: Wow, I used to have a doggo that looked just like you! Okay, I’ll try to get that Ghost post written soon, and then my final wrap up post putting an end to this series once and for all. Oooooooo! I love this take, that the wolf is safeguarding Arya’s identity. There’s definitely that feeling that Nymeria is the last vestige of Arya’s Stark roots – but she’s roaming the Riverlands. I wonder if, once all is said and done, Arya will return to the North and Nymeria will, too? 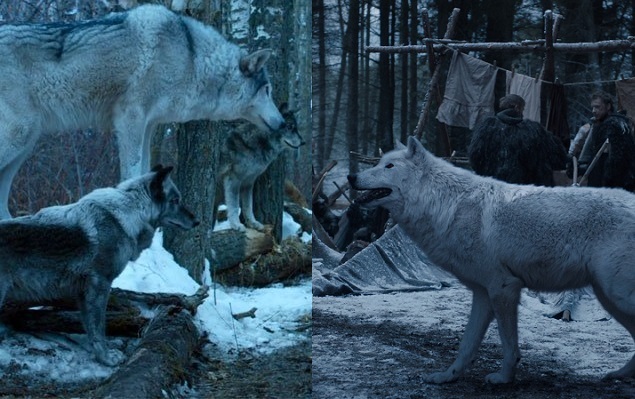 It’s not a huge plot point but it feels a bit parallel to Dany’s story and the connection between characters and their animal counterparts. To paraphrase Freud, in ASOIAF a cigar isn’t just a cigar and a direwolf isn’t just a cool thing to put on a flag. This is such a great post. Great point about the changes to the Braavos storyline, too – Arya walking around thinking thoughts isn’t great television. Arya fighting with the waif and having water cooler tal with Jaqen – good television. I’m glad you liked the article! I like you thinking about what’s in store between Arya and Nymeria might do when the big story is done. I’ll think about that, and hope to have something to say when I get to my final post in this series. Ugh, that previous comment is so mangled, grammatically. I’m not even going to edit it. Shame! Shame!